Access to the 1st floor by an external staircase. Room with a bed of 140. To organize your stay, museums, recreational activities or sports trips will we available. Beautiful appartment. Well equipped. Very nice hosts. Good location. I highly reccomand it. A fantastic rental with a fantastic couple to work with. We don't speak French, they don't speak English, but working knowledge of German on our side made it work great. Great location, beautiful apartment, very very clean. If we make it down to Alsace again this will be the place we rent. Thank you so much Christian. Myself, my wife and our two year old daughter have just returned from a fantastic vacation staying at this superb modern, well designed and immaculately clean apartment. The accommodation comprises of a double bedroom, shower / toilet room, kitchen / dining room, living room with an added discreet spare bed and a mezzanine floor above offering another spare bed. 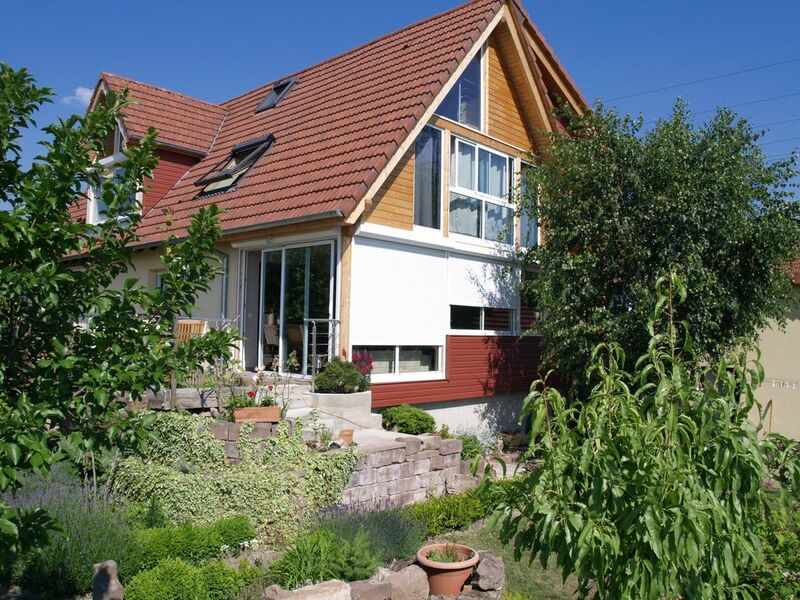 The apartment is elevated with a great view of the Rhine Valley, Black forest and Vosges mountains and has off street parking. When we arrived (albeit very late due to a road accident on route) we were warmly welcomed by the owners Christian and his wife who helped us to familiarise ourselves with the apartment, and settle in. They took an instant shine to my young daughter and kindly added a high chair and a cot full of cuddly toys free of charge to the rental. Turckheim is a very picturesque village nestled into the wine vines situated in the base of the Vosges mountains, the "Centre Ville" is only a ten minute walk from the apartment. We had a fantastic weeks holiday here in this beautiful area and visited many interesting places. The close by villages of Eguishiem and Riquewihr along the" Routes de Vins" are well worth a visit, as is Freiberg and the Black Forest in Germany only 40 mins away by car. If you have children then the "Montagne des Singes" Kintzheim is an absolute must. You can feed the monkeys by hand. My daughter loved it!! Several large supermarkets are on the outskirts of Colmar only 10 mins away by car, handy for shopping for needed provisions. 5 Stars go to Christian, his wife and their lovely apartment. We did not want to leave and will definitely return. Schöne, helle, modern eingerichtete und durchdachte Wohnung mit Flair! Wunderschöne, mit viel Geschmack eingerichtete Wohnung. Gut aufgeteilt, sonnig,freundlich. Mezzanin ist für mehr als zwei Personen ein zusätzlicher Pluspunkt. Die Vermieter sind reizende Menschen,die gerne auch Tipps fürs Einkaufen und für Ausflüge geben. Wir haben uns selten in einer Ferienwohnung so wohl gefühlt und kehren gern zurück.